Michael J. Fox's first prominent role came on a Canadian sitcom Leo and Me, where he played the main character's 10-year-old tag-along sidekick. Fox was 15 when he landed the part, but so short and baby-faced he easily passed for prepubescent. After that sitcom ended, he dropped out of high school to take a role in Letters from Frank, a well-reviewed TV movie starring Art Carney and Maureen Stapleton. Carney was impressed with Fox, and suggested he move to Hollywood. After relocating, Fox struggled and starved for a few years before he was cast in a recurring role as the grocery boy on Alex Haley's Palmerstown, but that program was canceled before Fox made much of an impression in his small role. By his own admission, Fox was awful in his audition for Family Ties, but he pleaded for a second audition and became that sitcom's breakout star, playing the all-too-Republican son of 1960s radicals Michael Gross and Meredith Baxter. It was one of the most popular shows of the 1980s, and gave Fox a springboard to movie stardom. In his best big screen efforts, he played Marty McFly, the time traveling teen in Back to the Future with Lea Thompson, an adolescent werewolf in Teen Wolf with James Hampton, a quick-rising junior executive in The Secret of My Success with Helen Slater, a coke-snorting office worker in the underrated Bright Lights, Big City with Kiefer Sutherland, a movie star adrift in the real world in The Hard Way with James Woods, and a big city surgeon stuck in a small town in Doc Hollywood with Barnard Hughes. After that, though, Fox starred in several disappointments -- Life With Mikey, For Love or Money, and Greedy with Kirk Douglas -- and by the mid-1990s Fox's cinema star had dimmed. After a supporting role in The American President with Michael Douglas and Annette Bening, Fox returned to television with Spin City, playing the affable PR expert for bumbling mayor Barry Bostwick. 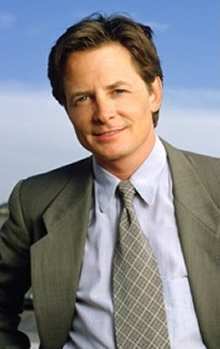 The show was another hit, but Fox had been diagnosed with Parkinson's Disease in 1991, and by 2000 his tremors were severe enough he had to leave Spin City. Parkinson's Disease is a neurological disorder that affects the central nervous system, making movement and speech shaky and increasingly difficult to control. Some of the symptoms can be temporarily reduced with medicines, but there is no cure, and when he is off his medication Fox says it is hard to speak or even control his facial expressions. He wrote at length about his day-to-day difficulties in his memoir, Lucky Man. Fox met his wife, actress Tracy Pollan, when she played his romantic interest on a few memorable episodes of Family Ties. By most accounts, Fox was always willing to sign autographs and chat with fans, but he became more withdrawn from the public after a stalker sent him thousands of threatening letters. Fox and Pollan are extremely protective of their four children, almost never allowing them to be photographed for publication. To the Screen Actors Guild an actor's name is his trademark, and when Fox joined the union another actor was already registered as Michael Fox. So our Fox, whose middle name is Andrew, called himself Michael J. Fox, taking his stage middle initial as a tribute to longtime Hollywood character actor Michael J. Pollard. Pollard is perhaps best known as the dimwitted gas station attendant in Bonnie & Clyde, or as a teenaged orphan in an episode of the original Star Trek where a disease killed children at adolescence. The other Michael Fox died in 1996, and is best remembered as the announcer in The Longest Yard with Burt Reynolds. Fox still works as an actor occasionally, most notably voicing Stuart Little, but he devotes most of his time and energy to his Michael J. Fox Foundation for Parkinson's Research, which has raised more than $80 million to fight the disease. He often visits Washington DC, trying to break through some politicians' resistance to stem cell research, which holds the best promise for curing Parkinson's disease. Apparently a lapsed Catholic, but attends a synagogue in Manhattan and is raising his children Jewish. See Michael J. Fox, Always Looking Up: The Adventures of an Incurable Optimist (2009): "It's fair to say I have staked a claim in Judaism. I've married a Jewish girl, and we are raising our children in the Jewish culture and, moreover, in the Jewish faith -- our three oldest have been bar and bat mizvahed." See also Nate Bloom, "Interfaith Celebrities: Michael J. Fox Receives Reform Award", InterfaithFamily.com, 8 January 2008. Hollywood Walk of Fame 16-Dec-2002 at 7021 Hollywood Blvd.